After having their asses handed back to them by an angry mob of rescuers, irate that their work was being run down by the RSPCA as being "... to the detriment of animals..."
The RSPCA has updated the wording on their blog. The “No Kill” is plainly and simply a marketing concept that has reaped millions of dollars for those shelters advocating this policy, to the detriment of animals and other shelters struggling to do the right thing by all animals not just a select few.... Having said that there are a number of rescue organisations, (not shelters as such), that that really are “no kill” organisations and RSPCA Qld deals with them on a regular basis. Most of these do a wonderful job and their dedication is second to none. This is yet another example of how the community works together to save lives. Often the RSPCA has put scores of hours of behavioural modification or performed major surgical procedures before they go to the rescue group. And rescue celebrated that they were being acknowledged, and the hubub died down. However, should rescue be happy with that? Most community foster care groups work from the homes of a small to medium number of volunteers, rescuing animals in their local community. But if you do your job well and spend a portion of your time on engaging with the pet lovers in your community, you may build your support to the level that you can open a facility, kennels or cattery with which to expand your ability to care for pets. If a no kill community foster care rescue builds a sheltering facility, do they go from being a good guy to a bad guy? It is a wonderful thing when life-saving organsation find themselves having enough financial success to expand and refine the way they operate. More capacity in the community to care for pets means more lives saved - especially in the case of 'special needs' pets, where the high-volume, high turnover, pound model has traditionally failed. If the RSPCA believe rescue is "good" for pets - how can it then simultaneously advocate that these same groups working out of a shelter is now suddenly "bad" for those same pets. In short - they can't. So why pick this fight with shelters who have committed to life saving programs at all? If the RSPCA is able to get rescue and no kill shelters arguing amongst themselves, it would be a real boon - anything that can distract from the failure of the RSPCA nationally to making a commitment to life-saving. Distraction is the only strategy left in the face of increasing evidence that no kill shelters are no only more compassionate, but are more effective, more innovative, and more enthusiastically supported by the community. The focus needs to shift away from euthanasia rates... A “less kill” policy is the reality. The “No Kill Shelter” is purely and simply, a myth. It's not a myth when it's already being done. And public accountability now for performance is the last thing they want to see, when for literally decades their income was in no way connected to the quality of the job they were doing. Currently the RSPCA generate $140 million dollars PER YEAR in revenue nationally, plus maintain $240 million stockpiled in cash and assets - while still crying poor. No kill is a community solution. 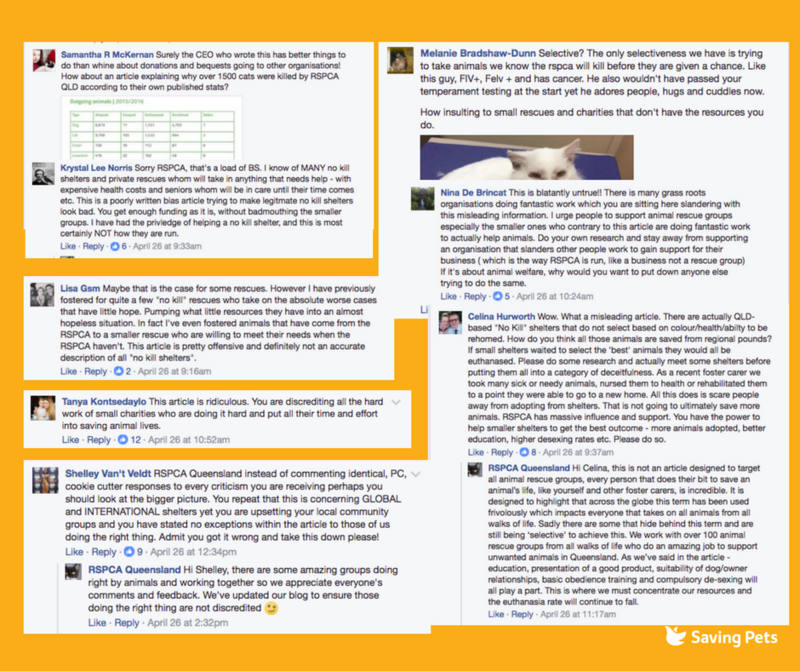 Community-based animal shelters, run by the same people who are now running no kill community foster groups is a nightmare of a threat to the current RSPCA management. It is impossible for any one organisation to maintain a monopoly on processing pets for revenue, donations and bequests in a healthy, multi-solution environment. The era of the mega-pound is over. However, they're not going away without a fight. As a rescuer, you should know that this is just the first in a series of programs designed to undermine your operations. If the RSPCA succeed with putting branding no kill rescue and no kill shelters as somehow different things in conflict with each other, the next step is to try and generate interest in legislation which regulates both (enforced by the RSPCA)... for the good of animals of course. It is already happening. Spoiler alert - It does not end well for rescue. What's the difference between a no kill community rescue group and a no kill shelter? Rescue groups don't threaten the bottom line of the RSPCA. See also: Is your rescue group planning to appear at the Million Paws Walk? More reading: Is 'no kill' to blame for the RSPCA's failing reputation?